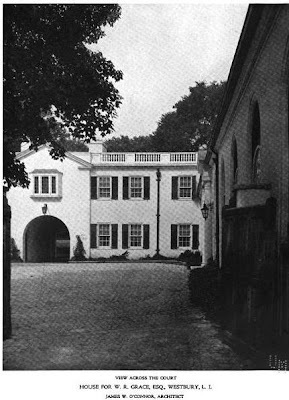 'Crossroads', the estate of William Russell Grace Jr. designed by James O'Connor c. 1919 in Old Westbury. 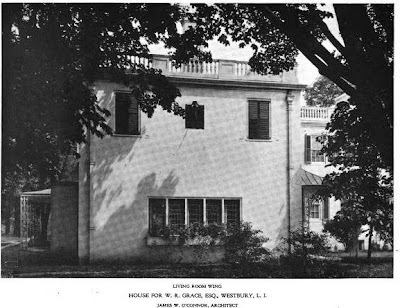 Grace was a director at W.R. Grace & Co. and was vice-president of Ingersoll-Rand. 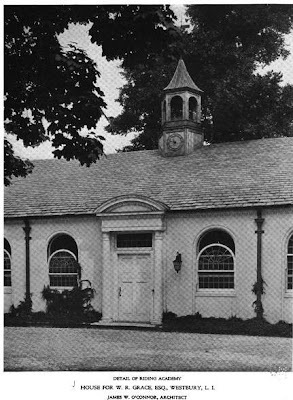 The grounds consisted of a colonial farmhouse that had been added onto over the years and Grace brought in O'Connor to turn the house into a full fledged estate. The plans below do not include the sunken indoor tennis court which O'Connor added shortly afterwards. Click HERE for more on 'Crossroads'. Click HERE to see 'Crossroads' on google earth. 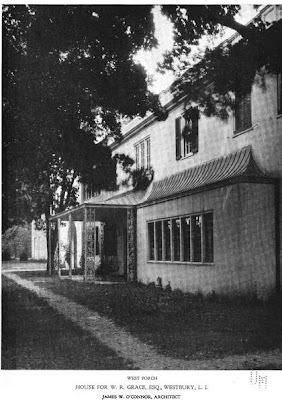 Pictures from Architectural Review, 1919. Click below to see 'Crossroads' intact with the 1/4 mile race track and vegetable garden intact in a 1966 aerial shot. 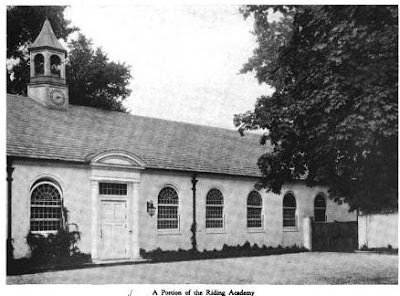 I love the Riding Academy and could see myself living there after the big house had to be torn down due to high taxes. That floor plan really is irritating. It's as if a seamless façade was just placed over the higgledy-piggledy. I've always been fascinated by this odd house, and seeing the floor plan not only satisfies my curiosity, but confirms the oddity. My guess is that the two unnamed rooms and stairhall immediately to the left of the dining room are the original house? 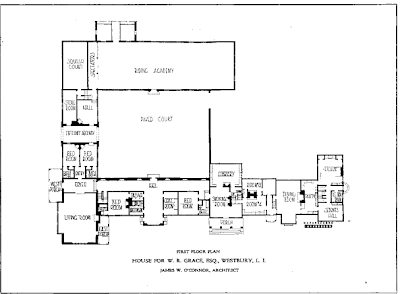 Looks like the typical floorplan of a long island quaker farmhouse. Yep, that's exactly right. 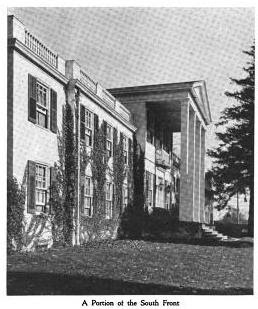 The property belonged to Benjamin Hicks. I was told that the site was originally an inn. I believe the inn building is part of Crossroads now, possibly the long building that runs along Wheatley Road that has been adjoined to the house. I just looked the place up on Bing Maps birdseye view...fascinating. I see that not only was the tennis house added, but the servant's wing extended. And also, the portico on the garden facade is gone. What is the place used for now? In the late '90s it was purchased by a feng shui group from California and it still owned by them. I believe they were from the Lin Yun temple (or Yun Lin). I rather enjoy this estate despite the configuration flaws. In particular the attractive stable block is quite noble and functional like that of Ambrose Clark's (Broadhollow) or Marshall Field III's (Caumsett). 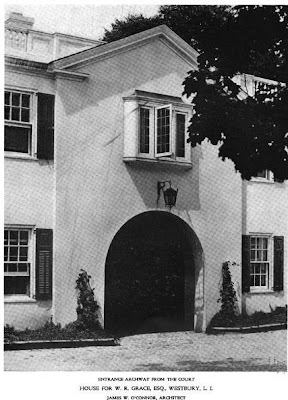 Grace - like many other noted residence of the Gold Coast - built a winter estate in Aiken, SC ("Two Trees", 1929) which had similar cues for the stable there. The Grace family owned Two Trees until 1979 and it would be owned shortly thereafter by entertainer Any Williams.